The thylakoid membranes of higher plant chloroplasts show ATP-dependent protein kinase activity which results in phosphorylation of a number of membrane polypeptides including those which comprise LHCP (Horton, 1983a). The physiological role of this protein phosphorylation is to exert control over the rates of photon delivery to the two photosystems. Experiments using isolated pea thylakoids clearly demonstrated that the kinase activity was controlled by the redox state of the plastoquinone pool. More recently, it has been shown that ADP can act as a kinase inhibitor and subsequently that kinase activity is dependent on energy charge (Hartwell et al 1982). In the latter work it was suggested that redox transitions merely act as an ‘on/off’ switch rather than a continuous modulator, the major physiological control being attributed to energy charge. In order to fully understand the role of protein phosphorylation in vivo it is necessary to understand which of these regulators is a major control factor. Experiments using the manipulation of carbon metabolism in isolated intact mesophyll chloroplasts from maize, provides an ideal opportunity to distinguish between the regulation of kinase by plastoquinone redox state and by adenylate status. 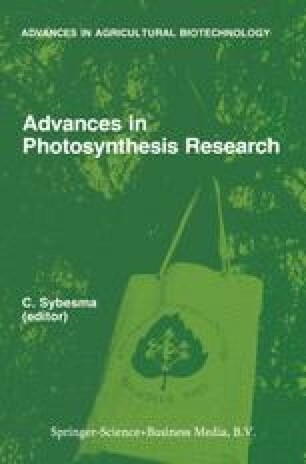 The maize mesophyll chloroplast contains the enzymes of the reductive phase of the Calvin Cycle, phosphoglycerate kinase and glyceraldehyde-3-phosphate dehydrogenase and the C4 enzymes, pyruvate Pi-dikinase and NADP-malate dehyrogenase. Addition of pyruvate stimulates ATP utilisation, the addition of oxaloacetate (OAA) causes the utilization of reducing equivalents without ATP consumption, while the addition of PGA requires that both ATP and NADPH are consumed. In this paper we describe simultaneous assays of redox state, ΔpH, ATP/ADP ratio, O2 evolution and protein kinase activity in these chloroplasts.